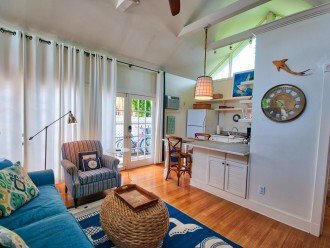 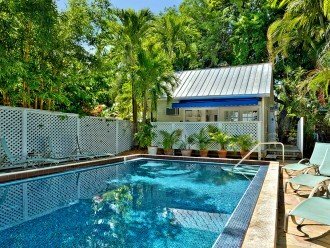 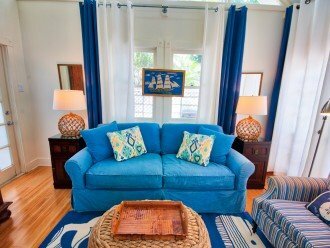 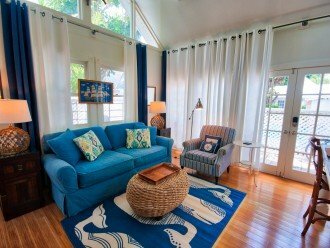 Located in The Colony, a secluded compound just steps from Duval Street, Colony Poolside is a peaceful retreat. 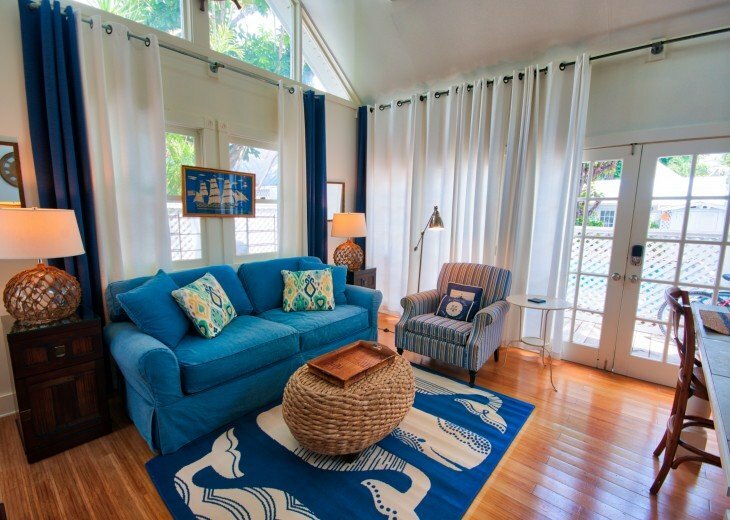 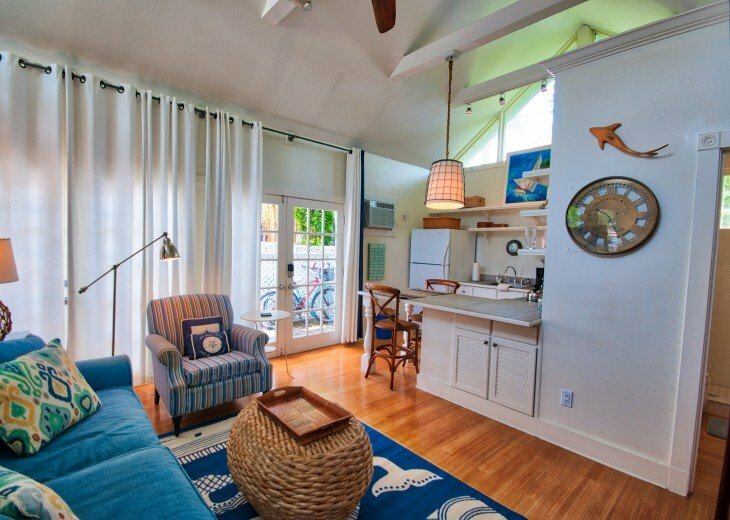 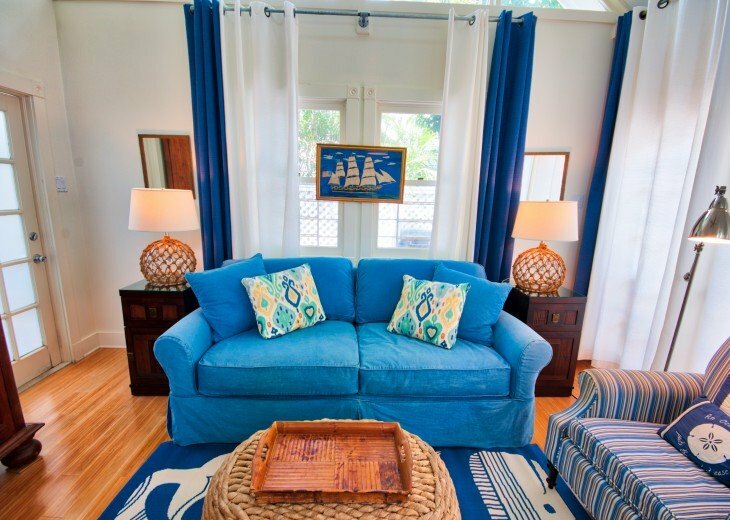 Enter the home through the serene and inviting living space, accented with blue and white decor, wood floors and pops of color from nautical-themed accents and artwork. 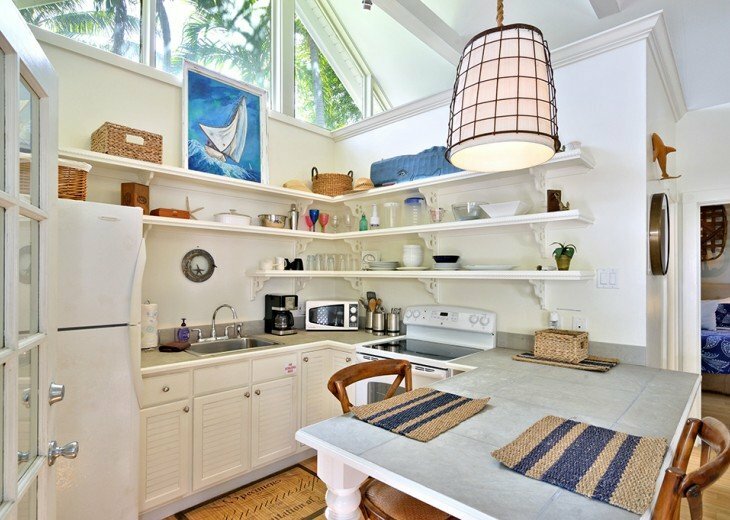 A vaulted ceiling with exposed beams and huge transom windows that extend all the way to the tip of the roof add a bright and airy feeling to the cozy space. 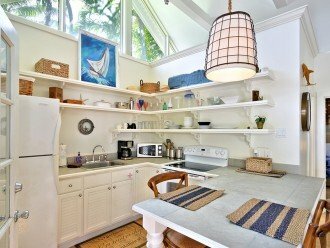 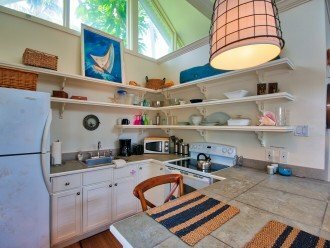 The fully appointed kitchen is attached to the living area and features a generous sit-down bar and charming open shelving. 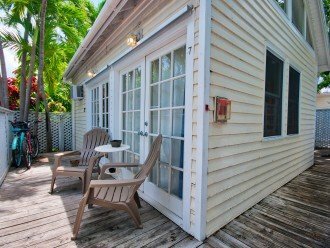 Through the French doors lies a private deck for sunning, relaxing, grilling and al fresco dining. 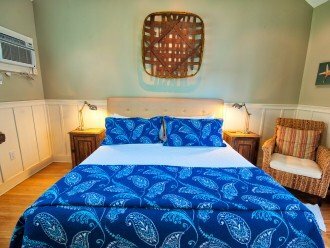 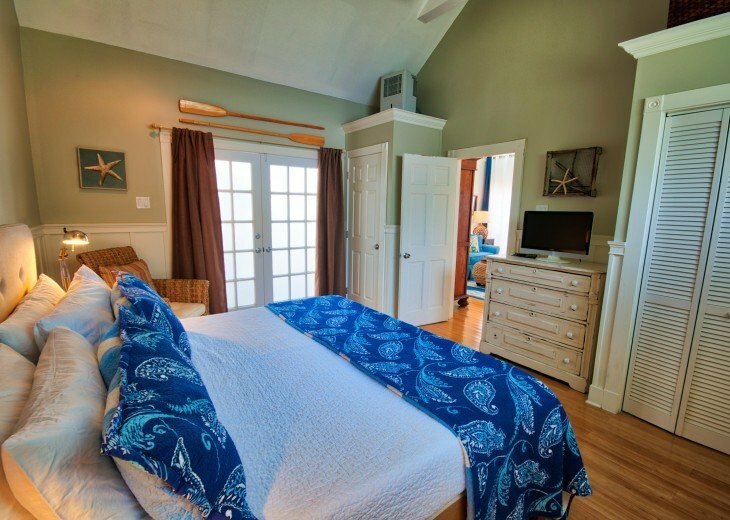 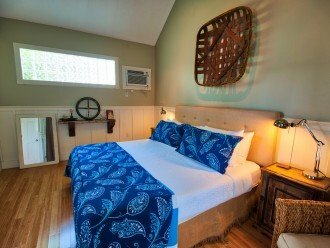 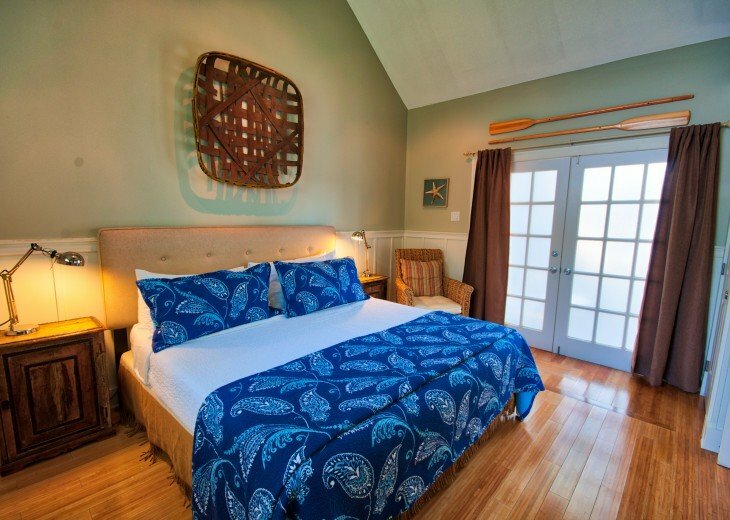 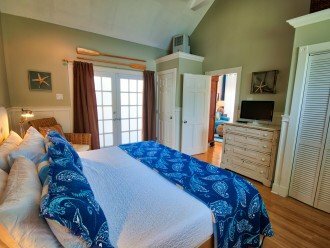 The bedroom is accented with wainscoting and features cathedral ceilings, a king size bed, and flat screen television. 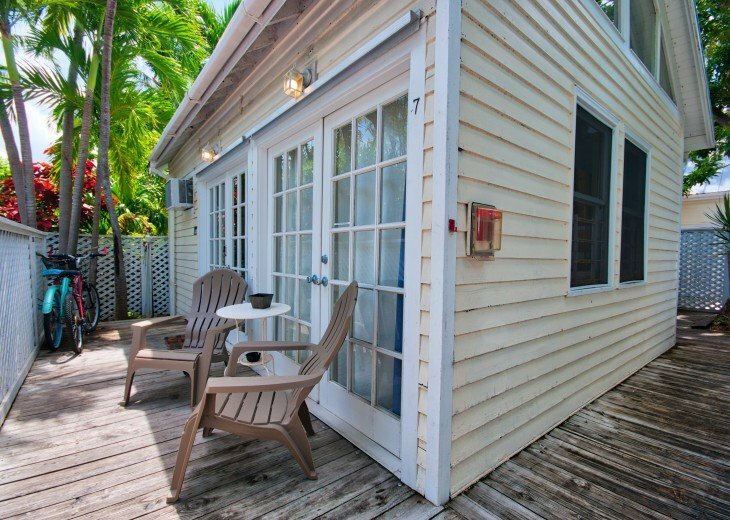 Back outside the front door is a porch with Adirondack chairs for enjoying a morning Cuban coffee or a twilight glass of wine among the palm trees. 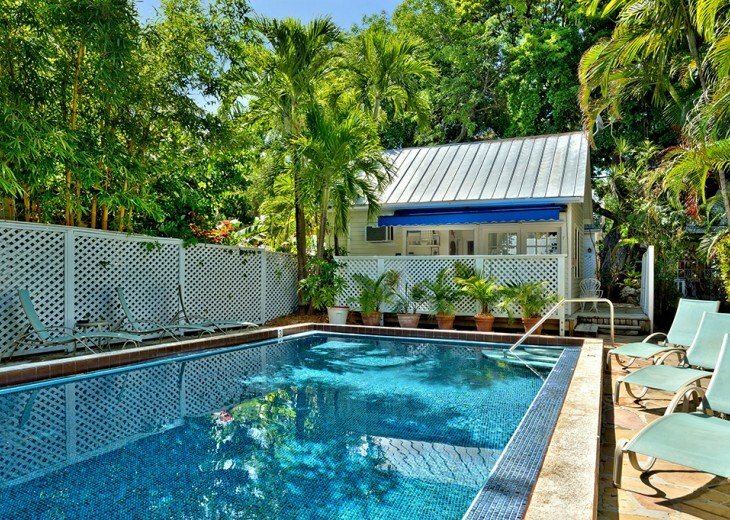 The huge Colony swimming pool, which is shared with other residents, is located just steps away. 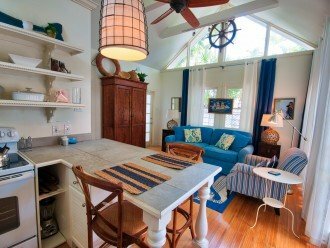 Beaches, shopping, and award-winning restaurants are just a short walk or bike ride from your front door. 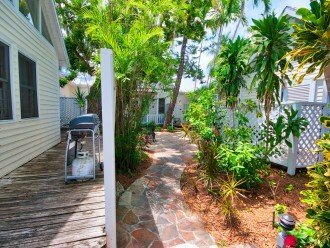 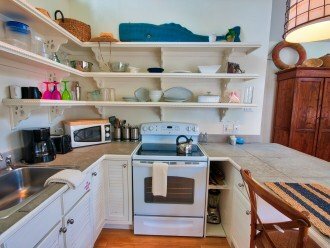 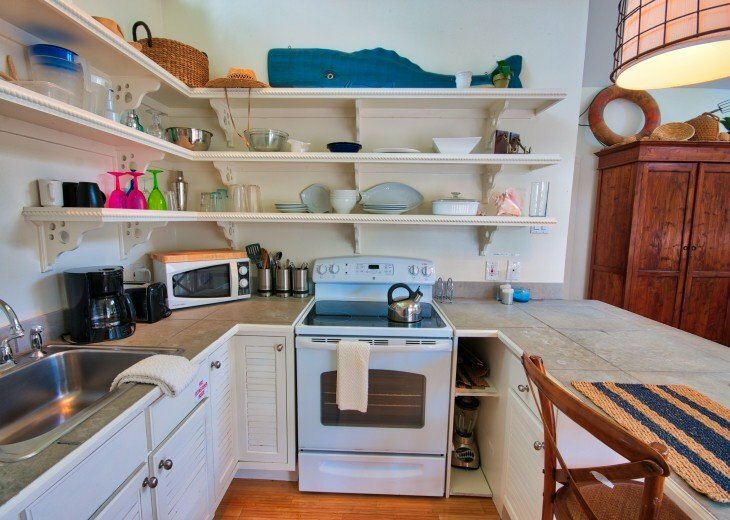 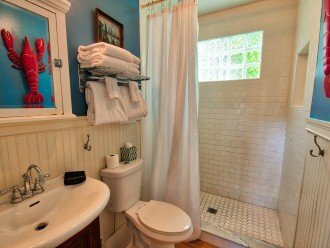 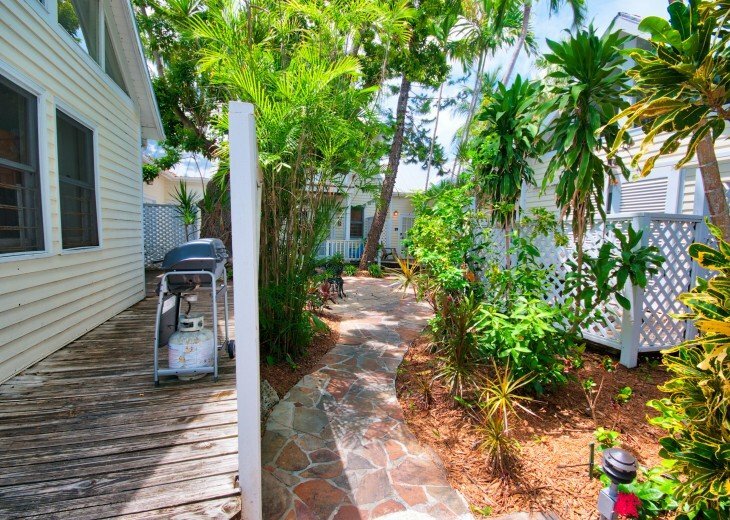 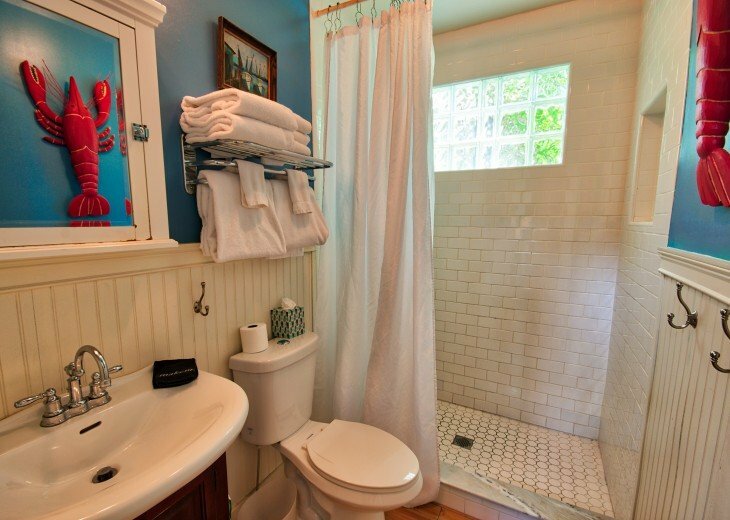 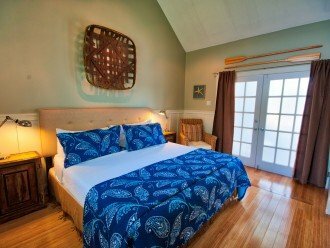 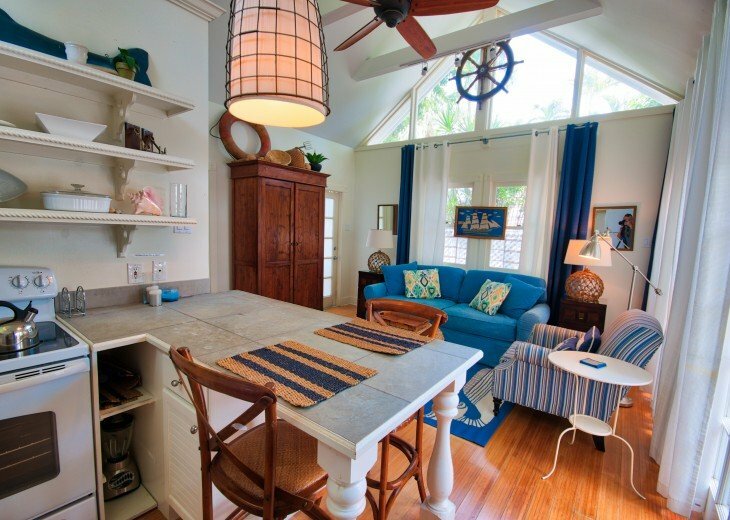 If you are staying with a large group, please note that Rent Key West Vacations has two other similar properties to rent within this compound- Colony Sunset and Colony Calypso.